The last setup was 850F/700R. I talked to this spring company today. It sounds like this entire range of springs will work for us. They range from 700lb/in to 1300lb/in, are 7" long, and are all 5" OD, flat ground on both ends. All of their ID's should work with the current upper perches, and the bottom will fit right into the LCA. They guarantee the rate to be within 3%, which seems typical looking at HyperCo, Eibach, and Swift. But, they said everything is rate tested before it ships. They also guarantee the height will remain within 1% of original for 1 year. The company is Suspension Spring Specialists out of Indiana. 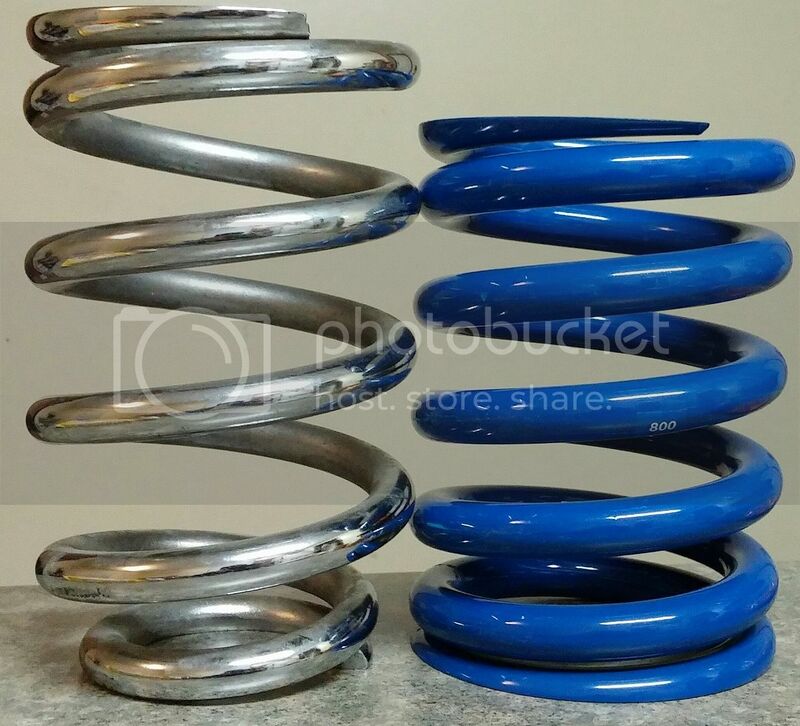 They seem to go by "Blue Coils", and their website is bluecoilspring.com. I have a pair of 800lb/in springs on the way. I'll probably wait until after the holidays to do anything with them. They were in stock and shipping out today. They are a couple dollars cheaper than the QA1 springs. Trying to find info on them prior to purchasing, I found that FCM has used them since ~2010. Re: bump stops- I think I'm abandoning the adjustable engagement point. It has two big drawbacks - cost and unsprung weight. I think I have a better solution, now that I've measured the available space. My idea is to thread the ID of the upper perch, then have a cylinder thread into it with a bump stop cup attached. I'll have to model that and do FEA to ensure the perch will still be strong enough. I'm thinking make an adapter to hang a bar directly below using a longer bolt. You can see in the pic across the bottom that the diff might be in the way for a big bar if it's mounted really close to the bottom of the box. Having it offset down a little bit might make a straight bar possible without losing much ground clearance. The exhaust will definitely need altered or removed, but I've been planning that anyway. The bar will be ~37.75 inches for the straight section, and the arms should easily mount to the lower shock bolt or LCA attachment on the knuckle. That should give nearly a 1.00 motion ratio depending on link angle. The arm routing looks to be fairly simple, also. 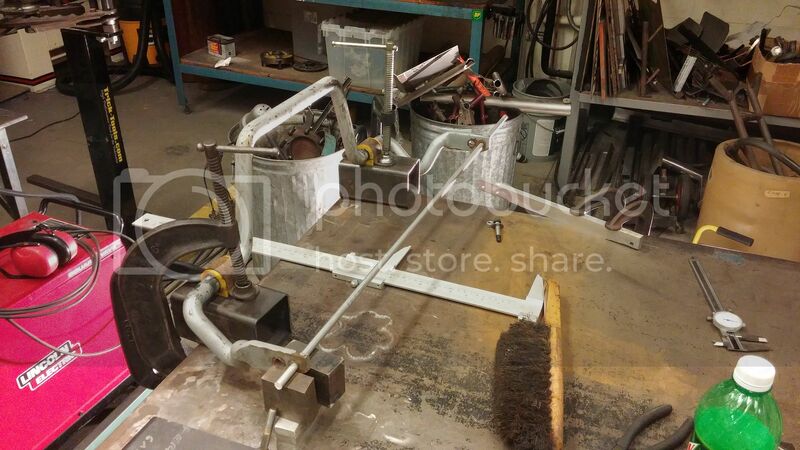 A welded end or one that is detachable will probably be easier than bends. It's likely only 1 of these will ever be made, lol. Re: stock sway bar dimensions - there are a lot of bends in this thing. I did a quick and dirty calc of the roll resistance by adding the straights, using a 7.75" lever arm with the. 33 MR. I know this isn't accurate, but I think it should yield a higher than actual figure. I come up with ~9500lb/1° body roll. 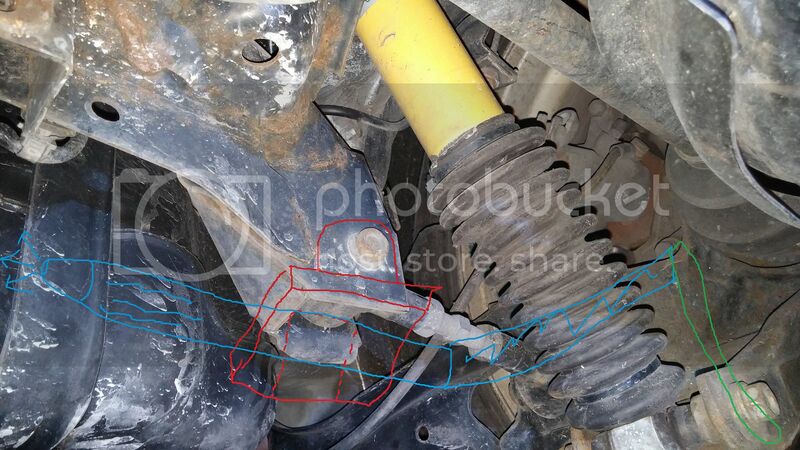 Comparing to that figure with the potential second sway bar, an equivalent roll resistance is had with a bar of only ~12.5mm if it has a ~5" lever arm (which would be the case if attached to the lower shock mount on the knuckle). Shaikh has been using SSS springs for a while, he says they are similar to Eibach. I will be running SSS springs on my Miata. I thought you were the right guy to make a second rear swaybar a reality. Very good start. Mazda was compelled to have a flat bottom by industrial engineers, most interested in the look. Keep in mind an adjustable two rate design, if possible. I had much more room, and made it 5 way adjustable on the GT-6, with 5 positions for the pivot block, to keep the vertical link vertical. On the Rx7, the Eibach rear bar had 2 positions, like the MS6 whiteline. So I slotted the holes in the pivot bushing mount to keep the end link vertical in the stiff holes. This only works for bars that mount like in the front, where the mounts can be moved fore and aft. For pivots that mount like the oem MS6 rear, a spacer could be used for the soft position, and removed for the stiff one. 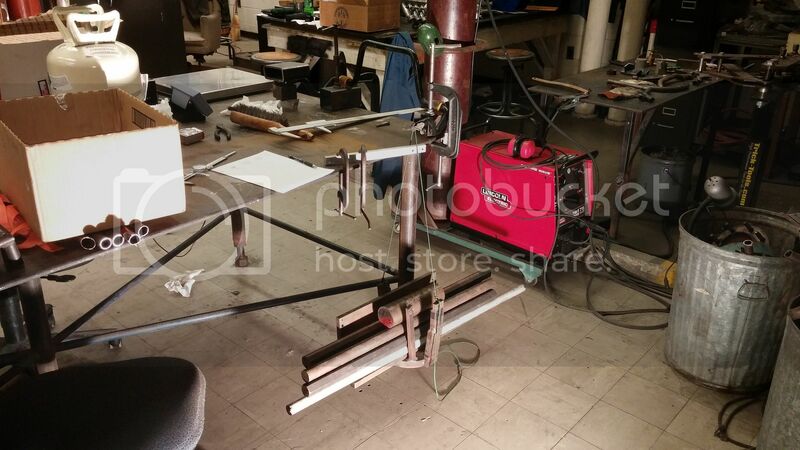 Making the front bar adjustable was mentioned before. This has little payback, imho. The bar end is flattened and bent, allowing minimal adjustment. And the lever arm is very long, requiring more distance between a hole pair, vs the rear bar. Last edited by KevinK2; 12-22-2014 at 04:49 PM. Kevin, Robert @zenit, and Tomas, do you guys agree that the figure and method I've posted for the WL/stock rear should be higher than actual stiffness? I just need a sanity check, haha. 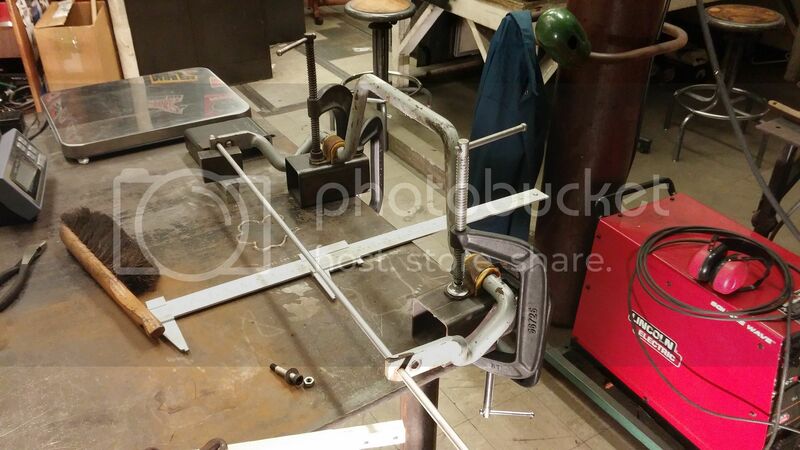 I'm still planning to measure the stock bar's stiffness, because I need a better baseline for the other bar. To get a realistic idea of the stiffest value for the oem bar, use the A,B,C convention of the Puhn formula. Ignore the big vertical loop, and the loops under the axle .... these add flexibilities, so the real stiffness will be less than this max limit calculation. Then imagine it is made in a planer fashion. So the B or twist length is the separation of the pivot bushings + the projection beyond at each end, and rotate the bend so it points at where the lever arm holes are. This allows you to get the intersection point of the strait bar, to establish torsion bar length, and lever arm length. Finally you need to do a cosine job on the link load to get the component square to the lever arm. I think using a 13.25" twist length is too short. I can see you rotated the sketched bar to get the real orientation of the bar, relative to vertical endlinks, Correct? To check strength, which FEA program are you using, the one that comes with the CAD program? Are they owned by a school? Just curious. Last edited by KevinK2; 12-23-2014 at 09:19 AM. I know it is much easier to ask than to do, but you seem to be handy with a MS Paint type program, to mark up pictures. With 2 pics you already posted, it would be very informative to sketch in the bar pivot bracket attachment to one of the close ups, and part of the bar assembly in your side shot. I think the stiffness of this efficient bar will be so much stiifer than the oem, that you could just remove it as needless weight, and a pain to work around. Yor initial estimated stiffness would support this action. Kevin, Robert @zenit, and Tomas, do you guys agree that the figure and method I've posted for the WL/stock rear should be higher than actual stiffness? I would say this sounds right. I would expect that the analysis would be optimistic (higher) than the real stiffness, due to all the bends have some effect on the stiffness. Of course, I'm really not smart enough to understand all the controls of analysis. (Social Sciences degree) I would recommend if the load cell measurement goes well that you actually measure the load in situ. I'll send you a message about this. The 7.75 is possible. But using 13.5" for the transverse length seems to be too short (stiff) for the length where torsion created by the lever arms occurs. The method I suggested is a more realistic upper limit for what the stiffness could be. Where did the 13.5" come from? 7.75 is the longest lever arm length. It's the distance between the center of the bar's pivots (center of moment), and the end link hole. That's assuming the end link (force vector) is tangent to the radius created by those two points. The 13.5 is actually 13.25, and is just the 3 straight sections added together (8.5 + 2.375 x 2). That should give us a stiffer than actual, because the lever arm length is longer for the center section (and my calc assumes totally rigid lever arms). It was just something to get in the same ballpark (or maybe its parking lot) of ARB stiffness for the comparison to the second bar. I'm still going to measure the actual stiffness to get a better starting point for the second bar's required stiffness. I see now. My assumption was that what goes on in the 2 transitions from the bar in the pivot bushings to the offset 13.25" parallel length ( each transition length = (15.5-8.5)/2 = 3.5" ) includes bending of the extra length of bar. So I'm assuming the transition is more flexible than 3.5" in pure torsion of a bar with no offset, and you are assuming the transition is infinitely stiff, which implies the big offset design adds stiffness to a design with no offset. So I come up with a net twist length of 20.25 + 2 x 3/4" to get to the C/L intersections with the lever arms, = 21.75" . After all that, my high side stiffness estimate is 61% of your value. Last edited by KevinK2; 02-24-2015 at 02:54 PM. They have just a slightly larger OD than the 600lb/in QA1's, and these 800's have a slightly larger ID. They fit pretty nicely into the LCA. They have a little bit of room to wiggle around, but they shouldn't move too much. That center section is raised a bit and should keep it mostly centered. The upper perch has similar wiggle room. I see now. My assumption was that what goes on in the 2 transitions from the bar in the pivot bushings to the offset 13.25" parallel length ( each transition length = (15.5-8.5)/2 = 3.5" ) includes bending of the extra length of bar. So I'm assuming the transition is more flexible than 3.5" in pure torsion of a bar with no offset, and you are assuming the transition is infinitely stiff, which implies the big offset design adds stiffness to a design with no offset. So I cone up with a net twist length of 20.25 + 2 x 3/4" to get to the C/L intersections with the lever arms, = 21.75" . After all that, my high side stiffness estimate is 61% of your value. I pulled the whiteline bar yesterday and should have the shop to myself this afternoon/evening. I have the stock front bar, stock rear bar, and now the whiteline to test. We'll have better figures soon enough. It might be worth designing this second bar just so I never have to deal with the stock location bar. 3 hours to pull it and have the car back together! Not sure as I haven't really followed how you deduct that spring/flex rate from 1 degree of body roll. For me it would be simpler to relate the 9500 lbs spring rate to a degree of flex from the axis of the bar itself or to a value in the form of travel. 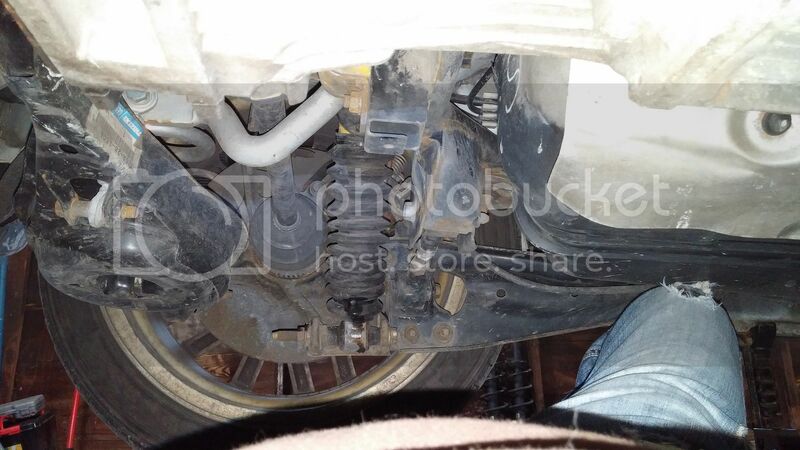 Not sure how much 1 degree of body would bend the sway bar in other words. At face value 9500 lbs for 1 degree of body roll sounds very very high. that would be the same as applying 9500 lbs of vertical force to the brackets that hold the sway bar if I am looking at this correctly. Sounds very high. But may be I am looking at it wrong. I don't know either how your toe box connected sway bar would work as I can't really envision it. It sounds like an interesting concept and I hope it works just for the hell of it. Having to remove, or do without the exhaust, or relocating part of it, is a bummer though. Sorry, it's in-lb/1° body roll. So ~800 lb-ft/1° body roll. The angular rate would be ~100lb-ft/1° twist. Edit: I'm second guessing myself on the angular rate calc. Too many numbers floating around after measuring all these bars! Last edited by phate; 12-30-2014 at 10:51 PM. ... I pulled the whiteline bar yesterday and should have the shop to myself this afternoon/evening. I have the stock front bar, stock rear bar, and now the whiteline to test. We'll have better figures soon enough. That will be great! The original Puhn equation assumes no bushing flexibility. For my DP Triumph, I bought solid aluminum bushings from Huffinger Racing, made from 1" plate. Bolt holes for attachment were drilled before cutting the horizontal split. The 2 mating surfaces were then machined to a fine finish. Then the bar's bore was made while the 2 halves were bolted together, using the installation bolt holes. I made 2 equi-length endlinks from TFE fabric lined Rod-Ends. 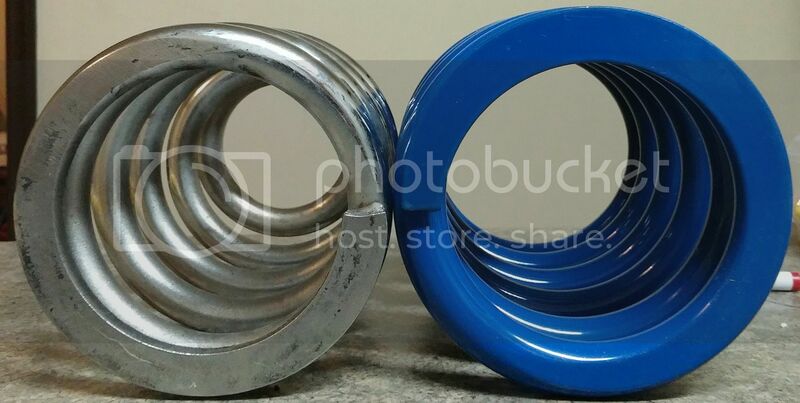 You will have to decide which bushing and endlinks to use. If the test goes quickly, it would be ideal to fully test the oem set-up options, oem + poly bushing, and oem with no elastomers, ie soild metal joints. And for the other bars, use the bushings you want to test. I know it is much easier to ask than to do, but you seem to be handy with a MS Paint type program, to mark up pictures. With 2 pics you already posted, it would be very informative to sketch in the bar pivot bracket attachment to one of the close ups, and part of the bar assembly in your side shot. I think the stiffness of this efficient bar will be so much stiifer than the oem, that you could just remove it as needless weight, and a pain to work around. Your initial estimated stiffness would support this action. Last edited by KevinK2; 08-09-2015 at 02:35 PM. I have always normalized springs and bars to spring rates at the wheel, a popular concept. You would be one of the few people seeking to relate body roll to sway bar twist. 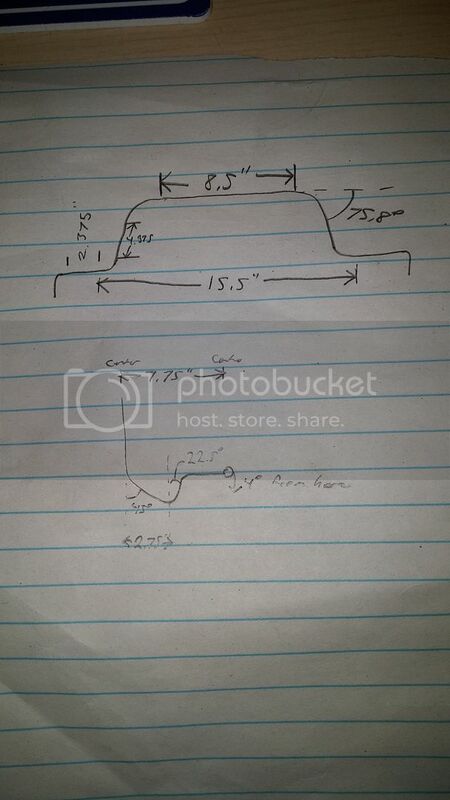 "9500 lbs of vertical force to the brackets" if that were the force value, one vector would be up, the other down. On visualization, it would help if phate had the time for drawing it on those recent underbody pics with side views. He mentioned 5" lever lengths .... not sure that is long enough to allow the larger displacements due to a higher MR. I didn't get a picture showing the entire rear suspension and toe link boxes that will allow me to. I'll search around for a pic where I can do it. The 5" lever arm with a 1.00 motion ratio, with my current max suspension travel of 3" would be a single side twist of ~31°, or total of 62° if both sides moved 3". I don't have 3" droop travel before the spring unseats, so it will pick up a wheel before that happens. I've been looking around at splined sway bars and some companies are rating them at 60° twist over a 40" length (minimum). So it seems doable. The bar will be symmetric, so you just need to show half of it. That's why I thought one the those 2 pics would do it ?? In this picture, I have the rod sticking through the end link holes so I can measure the lever arm length. I did this for all of the bars. The other side is hanging off of the table so I can hang weight from it. I just tied a conveniently shaped piece to it, one that could hold a bunch of metal bars and such. Before I started, I found 10 or so pieces that all weighed ~20lb each. I weighed each of them on one of our corner scales so I could record each addition and the associated deflection at three points: the end link and the two brackets. The end link height for obvious reasons, but I wanted to see how much deflection was in the rubber and poly bushings. It's quite the difference, but more about that later. That's ~225lb hanging off of the bar. Bar Lever Arm Length - This is the distance perpendicular to the bar's pivot axis and center of end link hole. *Can someone confirm I'm not crazy and that the measured 'Bar Vertical Rate' needs doubled for roll resistance calculations, due to the opposite movement of the wheels during roll (outside wheel goes up 1" while inside wheel goes down 1" during cornering, for example). This lines up with Staniforth's calculations, but he uses a generic constant of 19700 in his equations, which isn't very helpful. Of note are the WL bars measures compared to stock. They advertise it as 19% stiffer in the soft setting, and 40% stiffer in the stiff setting. The bar actually offers 57% more roll resistance in the soft setting, and 91% more roll resistance in the stiff setting. No doubt there's some error in the measurements, and I didn't account for the bushing deflection and overall angle of the bar in the calculations, but this should get us pretty close. It's especially helpful for trying to figure out what size bar/tube to use for the second bar. If we trust these measures and try to build something that offers similar roll resistance to the WL's stiff setting, we need a bar that is approximately 13.75mm OD (solid). But, now that we have all of these wonderful figures, I can plug them into the suspension calculator I built to come up with roll resistance proportion and roll angle. So let's do that for a few different scenarios. Remember that my weight distribution is ~59% front, so the proportion of roll resistance up front for a neutral handling car should be around that same percentage. I'll use the .57 rear spring MR for these. 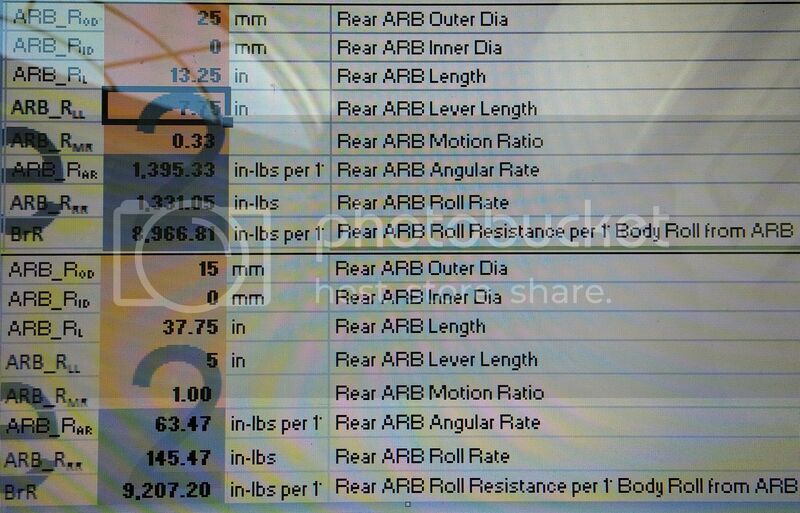 If I want to shoot for that 59% front roll bias changing only the rear bar, I need ~12,000 in-lb/1° RR from the rear bar (nearly double the current). That's a 16mm bar with a 5" lever arm. That much RR from bars is contributing almost 55% of the total RR, which seems like a lot to me. I think that's enough for now, though. Last edited by phate; 01-22-2015 at 01:55 PM. @Tomas;, I forgot to post this. Just a quick and dirty drawing of the second bar's potential location. Yup, double the rate for an inch. If someone has a table heavy/solid enough in the NATOR IL area, I might replicate this with the MS3 & Mz3 rear bar. P.S. I have heard of people using split delrin bushings for sway bars, but I was never sure it was a good idea due to binding/clunking due to it's hygroscopic nature and the tight tolerances it needs. It would reduce some of the bushing flex though. Great work! Yes, you have it correct. Bar rates in lb/in used to be published by Addco, and the rate was the bench test rate, as is the original Puhn formula rate, all being the single wheel bump rate. For cornering, use 2X for the reason you stated. Note the single wheel bump rate when the springs and bar is considered is often expressed as a combination of the spring wheel rate on the bump side, plus the bar rate in series with the spring on the opposite side. This is shown in Staniforth, Appendix 5, pg 214, last formula. It is wrong. The spring on the opposite side does not compress more, so the bump spring and bar act in parallel. 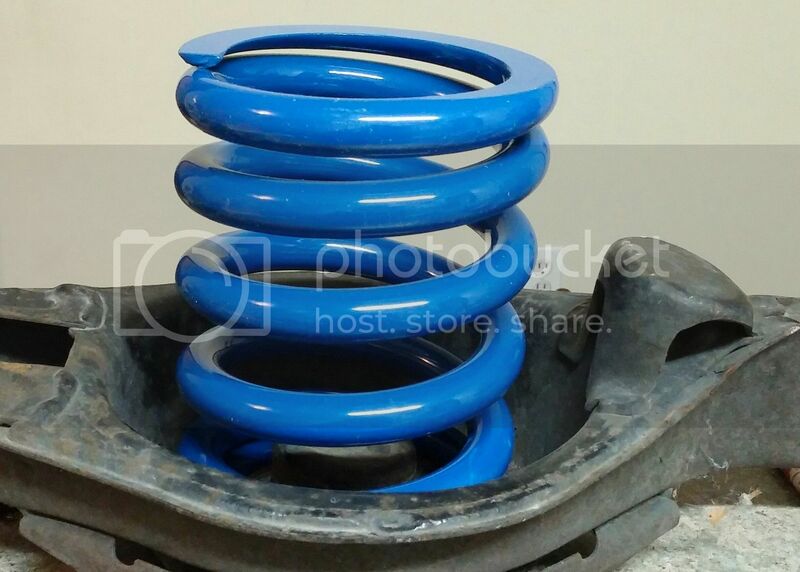 You would generally need endlink forces in excess of the spring preload while supporting the sprung weight of the car, just to start the spring to compress. EDITED: From a force balance consideration, the bar's reaction at the non loaded side is unloading that tire's contact force with the ground, rather than compressing that spring. Several references make the same mistake. The easiest way to visualize this is to consider a McPherson Strut suspension, with the bar's endlink attached to the lower ball joint. The poly bushings supplied with the Steeda bar are significantly harder than the Whiteline bushings for their rear bar. They were very difficult to open the split to slide over the bar, so I just slid them on from the end. The Whiteline bushings are pliable enough that I can split them without a problem. For the front bar, with poly bushings, going from 24mm to 26mm raised the test rate from 222 to 385 lb/in, for a 73% increase. In theory, based only on the D^4 stiffness relation, the rates for "rigid bushings" (no give) for the 26 would be (26/24)^4 = 1.38, x 226 = 312 lb/in, for a 38% increase. The bushings were likely different in geometry and stiffness, to account for this difference, with the stiffer bushings used on the Steeda bar. For the rear bar, going from the 23mm oem, with a LOOSE bushing, to the 24mm WL bar made a suspicious 57% increase in stiffness at the soft setting. If this setting has the same lever length as the oem bar, then the rate increase for the "rigid bushing" case, based on D^4, would be 18%, as WL had indicated for the soft setting. IMHO, using the WL bushing 1mm larger than the bar for the oem test, and also this bushing which was described as pliable compared to the poly bushings on the oem front bar, both could artificially lower the oem rear bar rate measured, and magnify the improvement of the WL bar. Delrin has been used in bushings that have perfect rotation on a single axis, like sway bars and conventional control arm bushings. This is due to it's extreme stiffness, as compared to rubber or EDPM. I know nylon is hydroscopic, so it is often sold treated with 50% humidity exposure. I have not heard of Delrin being hydroscopic. I personally used 2 piece aluminum split bushings (described earlier) for a front sway bar, that had no give and never squeaked ( antiseeze lube). .... Before I started, I found 10 or so pieces that all weighed ~20lb each. I weighed each of them on one of our corner scales so I could record each addition and the associated deflection at three points: the end link and the two brackets. The end link height for obvious reasons, but I wanted to see how much deflection was in the rubber and poly bushings. It's quite the difference, but more about that later. 1) how did you measure the vertical deflections? 2) in your step wise loading, and incremental rate calc, did you look at the local rate, or at the net rate up to that load point, ie alway use zero load in the incremental load calc? 3) for now, could you report on the lb/in rate for just the 1st load increment, and compare it to the total load rate (no load vs full load deflections)? The 1st incement could be very dependent of the initial give in the bushings. 4) If you have a bar in the rig, could you check for bushing bracket deflection at full load, for the 2 brackets ( ie use a floor jack to unload the rig, then load it)? So please don't consider these questions to be critical in any way. I stand corrected about hygroscopic tendencies and delrin, I was thinking of nylon. Cool stuff if the manufacturer pays attention to proper clearance fits (I.e. lc4) and specific type of compound. This is one of the reasons I prefer and always have used the spring rate at the wheels, which is Puhn's way of normalizing bar and spring rates. The equations are cleaner, IMHO. You have lb/in, vs inch-lbs per degree. That equation is just for how much a rod of length L and dia D will twist when torqued. The units are in-lb per degree of bar twist. 1) I measured bar height on the inside of the brackets relative to the table for each weight addition. 2) The 'average' figures are the average of local rates, not the net up to that point. The ItF is the net rate between the final (fully loaded) and initial (no load) positions. I did those two calculations since I thought there might be some dependence on bushing material. 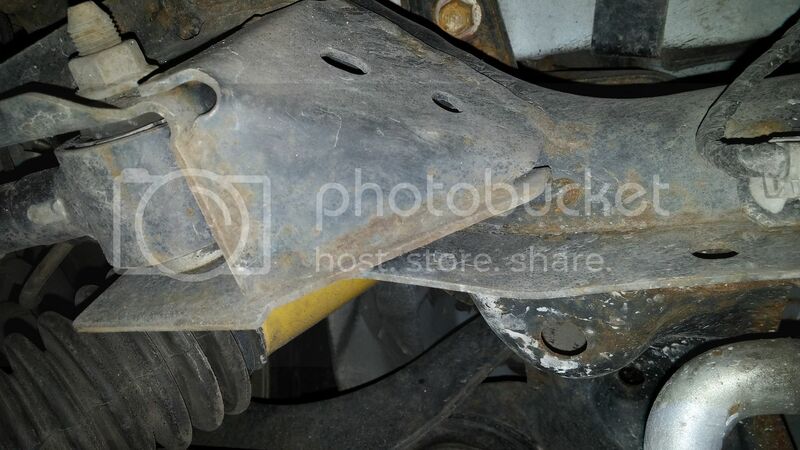 3) The only one that seemed highly dependent on bushings was the stock rear bar in the poly bushings. I didn't have the stock rear bushings, so I just used the WL bushings, which are 1mm too big. The first reading is ~1/2 the rates I have up above. Otherwise, there isn't much difference. That isn't really indicative of anything other than worn out bushings shouldn't be used. 4) I didn't measure or look at bracket deflection closely. When everything was fully loaded I gave it a once over to see if everything looked like it was still mostly the same and it was. 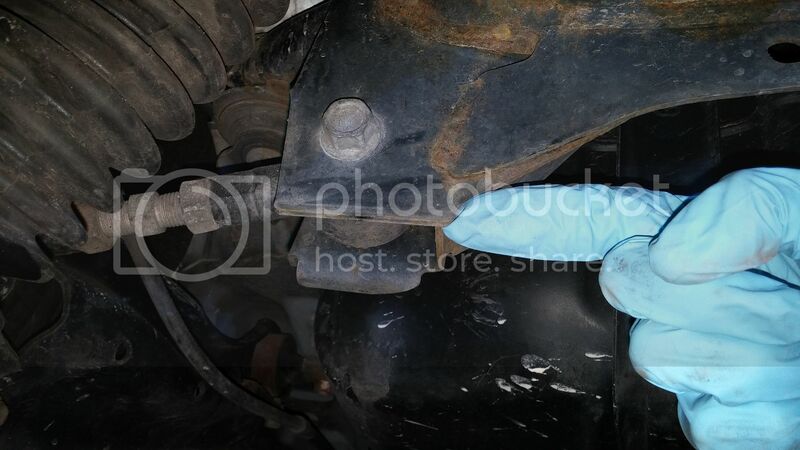 The orientation of the bushings for the rear bar is not as it would be on the car. They're rotated 90°. I didn't have a good/easy way to make a rig that oriented the brackets upright. I'm not sure if this was enough weight to make the brackets deflect any measurable amount. I haven't done anything with the deflection measures, so I'll leave it for later. I can see this happening, based on equations for (hertz) contact stress for a shaft in a close radial fit in another part. 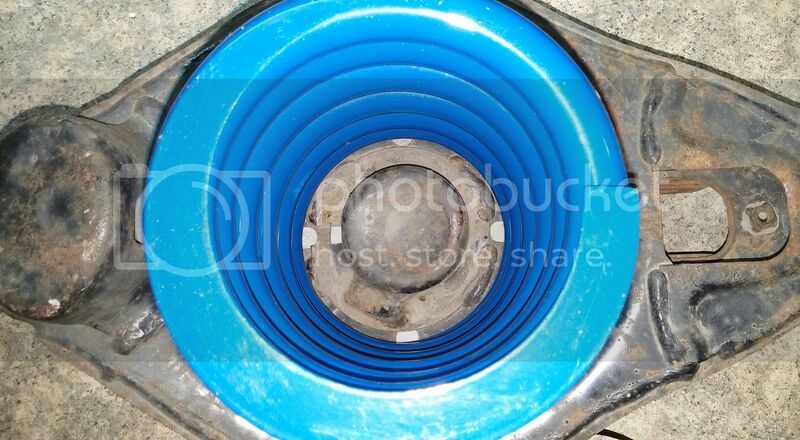 If the fit is .04" loose on the diameters, the sress is very localized, and the related deflection high. But I did expect the deflection of the oem rubber bushing to be relatively high in the 1st step increment, for the oem front bar. I tend to agree.The deflection of the housing in the vertical orientation is likely much less than the bushing material compression. I was interested in how stiff the table was, and since I had all the dimensions of the Mazda 6 front bar, same as MS6 geometry, I checked the front bar. The front bar rate with Puhn formula: For A=8.25 B=11 C=22, D=24mm, the bench rate was 500 lb/in, much higher than the test results, and beyond the softening due to the poly bushings. May need to check for bushing housing deflection, relative to the floor. Last edited by KevinK2; 01-04-2015 at 10:57 AM. I come up with ~414lb/in. According to Puhn, is that the (edit: not wheel) rate in roll? According to Staniforth's method, the roll rate should be 496lb/in, which assumes the infinitely stiff lever arms. I think we're coming up with the same figures, it's just that I measured only 1 side's deflection while the other side was held in place. You would double my vertical rates to come up with the rate in roll. That gets us between the Puhn and Staniforth figures. Last edited by phate; 01-04-2015 at 12:08 PM. I also came up with 414 lb/in for Puhn (using your more accurate dimensions), which is the bench test. I know this for sure since when I first saw the formula, I derived it so I understood it. It also says in his book that the stiffness is measured at one end. I had always thought that the oem elastomer bushings just had a softening effect for small displacements, and it then gets hard due to the high poisson ratio ( gets incompressible). Ill look at Staniford, but nearly 2x bench stiffness variation seems like too much flex from the bushing alone. Last edited by KevinK2; 04-01-2017 at 08:47 AM. If you consider a very short lever arm, situated 90° from the axis of rotation, both the Puhn and Staniforth methods give nearly identical results. Seems like they are both rates in roll. Which Staniforth method are you using? He has a Puhn like equation on pg 36, fig 2-7, and other equations in appendix 5. The eq on pg 36 may well be for cornering, as the L/2 is used. Think about the bench test, and assume 1" deflection at the loaded end of the bar. Now if that bar were installed in a car that was holding a steady corner, with the outside end of the bar deflecting 1" up, would the inside be at zero deflection, like in the bench test? No, the inside would be 1" down, for a net difference of 2" in twist from one end to the other. So for a single tire bump, the bench rate is fine, as is Puhn. But for a corner, that 1" down iincludes 1" up on the other side, relative to the frame. So for 2X the bench twist, the rate in cornering is 2x the bench rate. For a direct bench test that reflects the cornering condition, you would need a precise loading machine that would pull down one end, and push up the other the exact same distance at the same time, and use a load cell. Last edited by KevinK2; 01-04-2015 at 09:01 PM. For a direct bench test that reflects the cornering condition, you would need a precise loading machine that would pull down one end, and push up the other the exact same distance at the same time, and use a load cell. How much of a difference do you think there is between doubling my rate, and the method you've outlined? I don't foresee it being an appreciable amount. 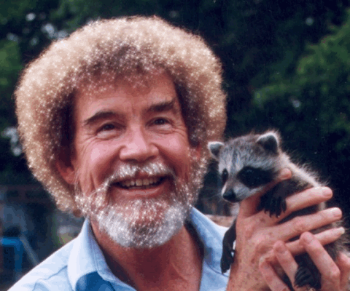 There should be no difference. As I said before, standard proceedure is to double the accurate bench rate (or puhn's formula) to get the rate to use in roll. While there is some twist at mid width of the bar for the bench rate, in a corner, that location has no rotation ... it's like it was welded to the frame at the mid width. Another way to see the bench rate is doubled when in a corner, as L/2 is used in the stiffness calc considering an effective mid length weld. Please let me know which Staniforth bar formula you used. I have a copy of the book. P154-155, in the weight transfer section. K vert = (Ang rate)/( lever^2 x pi / 180) = 496 lb/in. As Puhn was 414 with lever flex, this seems to be the similar bench test rate. Both of these rates seem to be twice the values you posted. I don't know why ???? I'm not totally sure, but those are the same values I get with the same formulas. If you get into the RR calcs Staniforth uses in the next few paragraphs, he doesn't double that bench rate. I was assuming it's the rate in roll. I've searched for other threads where someone has actually measured the rates on the bench, and haven't come up with anything good except the Bimmer forum thread. I'm not totally sure, but those are the same values I get with the same formulas. Your tabeled value was 244 in-lb/deg, but when I did the same calc, I got 580 in-lb/deg. And I derived that equation, and it's for the bench test type loadng, NOT for cornering. Your lb/in rate was 208, mine was 414. There should be no difference in these calc's per Staniforth equations. Note the "degree" here means at the sway bar, not body roll. For his calculated rate of the oem, he modified the cross section thickness to match the "measured" rate. The actual tube thickness is close to 1/2 the thickness where the endlink holes are: 3.9mm vs 4.1mm he used. Likely small effect. Last edited by KevinK2; 01-06-2015 at 11:32 AM.